The First World War ended on 11 November 1918. 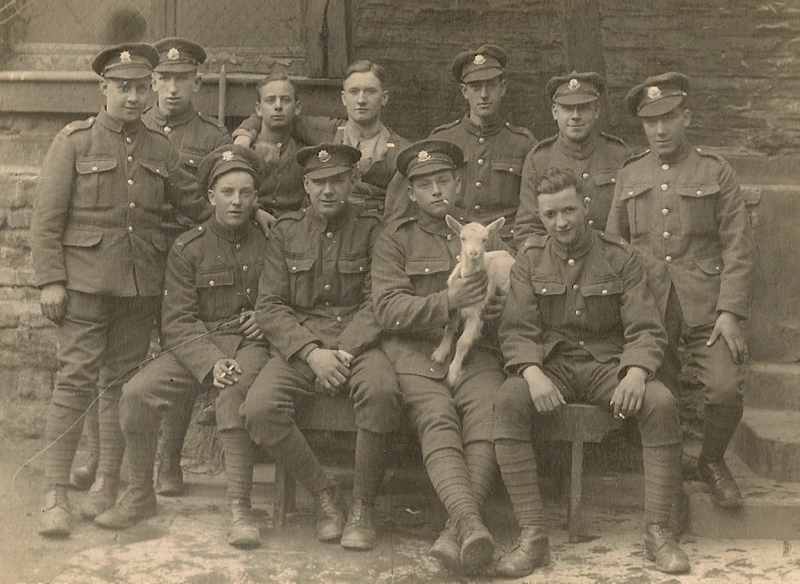 This photograph was taken in April 1919; these young men had survived. This is a snapshot in time of a group of men with their lives ahead of them, their futures uncertain but surely, with the war over, possessing hope. They are, of course, all dead now, but the picture brings life to each individual face. The fact that these squaddies have been photographed at rest allows us to catch a glimpse of their personalities; a more posed photo would have told us very little. I don’t know how many of them saw action in France but I see weariness in some of the faces, bravado and swagger in others. What do I see when I look at this face? The joker of the pack, I’m guessing. Cigarette hanging out of the corner of his mouth, legs outstretched, a goat on his knee. Handsome chap. Was he a bit of a ladies’ man or did he just think he was? Was he really as assured as he looks? What had he seen during the war? I wonder how was he changed by his experiences. How about this pair? Best buddies I think. More at ease than some of the others, posing without their caps; jackets undone. Maybe they were related? Brothers-in-arms. This man looks quieter than the rest. His cap is too far back on his head so he looks rather awkward. There’s a comforting arm on his shoulder from one of his pals. Has the camera captured sadness in his eyes? This last face, sitting on the far right, is smiling. He looks relaxed, his posture showing him to be at ease. And I do know what his future holds. His name is George Arthur Grinsell and he is my grandfather. He was born in 1900 and joined the army as soon as he could, aged 18, just as the war was ending, so probably didn’t see any real action. He became an accountant, married Elsie May in 1927 and had two children, Betty and my father, John. He joined the Home Guard (Dad’s Army) in the Second World War. He died at the age of 62. I never met him. But I know his face. Some of you may already know that since my dad died in February I have been typing up his diaries in the form of a blog ‘Memoirs of John Michael Grinsell’. It’s been a fascinating task and one which has helped me know more about my roots. Photographs such as the one above are now coming to light and somehow, appreciating how I fit into this circle of life, is a very healing process. The theme for The Gallery this week is Faces. To see more contributions, have a look at Tara’s website, HERE. What I thought when I first looked at that photograph was 'How young those boys are." My second thought was that they weren't all that much older than our own sons. As always, enjoying these old photos and the insights that come with them. Hope there are lots more where this came from. what a wonderful photo, they are look happy – relief I guess – can't imagine what they have experienced, seen, who they've lost. It is a photo you can look at and look at and imagine and wonder – each character. @ms Caroline – 18 is no age is it. Rory is nearly 16 now, doesn't bear thinking about. @kelloggsville – that's a fascinating point. In this case, the date is written on the back by my great Aunt. I know for a fact that my grandfather joined up late 1918 so I think the date is correct. I'm fascinated by old photos like this, you always wonder what they are thinking and I love how you've interpreted that. What a fabulous photo. The people in it are almost talking to is… if only we could hear what they are saying. As you know I am scanning all my grandparent's old photographs and finally, last week, got through all the snaps my granddad had taken during WWII – fascinating and sad. All his mates… most of which I know never made it. And yet my granddad and his two brothers all came out unharmed. Randomness or pure luck? Either way I'm grateful. A fascinating post, Trish, with a lovely photo of bright young men. I've seen many such photos but it's great to be able to put a name and meaning to one of the faces. It makes the group more real. Oh I just love this. I have a lot of these old photos somewhere and I ave a look now. I love your take on the theme, and this photo is fascinating. I also love the way you are guessing who these young soldiers were, and that your Grandfather was amongst them. That was a brilliant post. It is great to look at images like that and wonder what they've been through and what they're going to go through. Great that you know how one of them got on. Love looking at old photos! And the older I get, the less old the photos look. That's a truly beautiful post and I find myself blinking back tears at your words. So sorry for your loss. I see the same things in the photo: some have clearly seen too many things that a young man should not, others have managed to retain their innocence. Your grandfather's eyes show kindness. A great photo and great post. I wonder where he got the goat from! @multiple mummy – Yes, I've been thinking about Remembrance Day coming up. Looking at the photo personalised the occasion. @blurofwoodsmoke – thank you for stopping by. Glad you like my interpretation. @mari's world – it is scary to think our own sons would be conscripted. @Steve – that's great you're scanning the photos for posterity. So important for these memories to be kept. @Sarah, @little puffin, @funky wellies – thanks so much for your comments. I'm so pleased to have the photo and it's good to use the blog so others can see it. @it'sadadslife, @ghostwritermummy – Thanks for popping over and commenting. I really appreciate it. "probably didn't see any real action he became an accountant"
(it works with or without the full stop). @theboyandme – It is quite emotional looking at the photo, isn't it, especially when you study each face and realise what they went through. @Laura – the goat puzzled me too. I've heard of the regimental goat in Wales but these soldiers were from Scotland, or at least I assume they all were as that's where my grandfather lived then. @fiver blogging @cupcake mamma – thank you! @Troy – Ha, glad you found something to make you smile! I've been visiting Der Spiegel website to get the german take on the euro crisis but it does have other interesting articles. If you have a few moments follow the link to that specific article and I'm sure you'll enjoy reading it. Aboutlastweekend – I'm getting better at printing my photos off now. So easy to let them languish on the computer. Troy – Thanks for the link! So they found the skeleton of a goat. That might explain why there's a goat in this photo. Simply using it for milk. My mum reminded me that by 1917 my grandfather had been orphaned so was living with an aunt in Stockport. So these lads are likely to be from a Lancashire regiment, not a Scottish one as I said in a comment above. @knackered mother – I suppose my blog is my memoir; I think that might be the best (and easiest)way of leaving a legacy for my son! @Happy Homemaker UK – Welcome, Laura. Have paid a visit to you, too.